My wife and I have taken our daughter and son to quite a number of child-oriented entertainment and educational venues over the years, and we always come home with the same observation. Children are never expected to sit still, be quiet and pay attention anymore. Whether it is a movie or a theatrical production or a presentation on whales at the science center, if the audience has children in it, there is a constant hum of fidgeting, jabbering and sobbing radiating from a sea of perpetual motion. The last time we attended a children’s musical, there was a five-year-old behind us who talked at conversational level non-stop the entire show. I would hate to be the person up front with most of these audiences. I am pretty sure I would walk off stage just to see if anybody noticed. When I see school-aged children unable to sit in a seat facing forward and keeping their lips closed for even fifteen minutes, I assume that it is because they are un-churched or that if they are churched, their church does not require them to ever sit politely and listen for any period of time. They do not know how to calm themselves and be still and quiet anywhere because there is never any expectation at any point in their lives that they do so. I don’t even want to know what their classroom at school is like. Training children to worship means training our little men and women to participate energetically—for them to make lots of noise in singing and responding when it is time to do so, and to be very still and listen when it is time to do that too. This means that we have to expect a certain standard of behavior and communicate that to them effectively. Our shared work as a congregation in training our children to worship is first about managing our own expectations and agreeing upon a shared set of expectations. Here is a short list of those that it seems we all ought to be able to agree on. We expect children of all ages to be in worship with us ordinarily. We expect that when you have a room full of physical embodied human beings of all ages, those humans are going to have various needs to attend to over the course of an hour-and-a-half worship service. We also expect that with a little foresight and planning a significant percentage of these can be taken care of before and after worship. 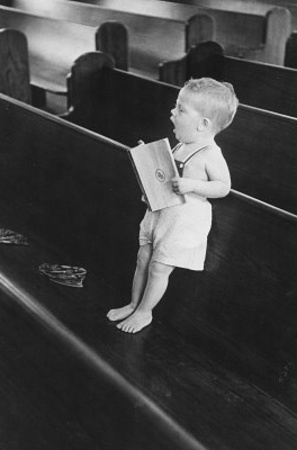 We expect that children over four to five years of age are ordinarily physically and emotionally capable of participating in all parts of worship to the best of their ability, and are able to sit in a chair, on their bottoms, facing forward, quietly, for the duration of the sermon. We expect that children are going to require considerable training to get them to this point, that there will be various setbacks and hurdles, and that children of all ages are going to need assistance and correction. Because we expect this, we don’t see accidents and lapses as colossal moral failings, but as opportunities for gentle correction and training. If we share these expectations, we then expect all other parents are having the exact same struggles that we are having and are as patient with them as we wish they would be with us. The goal here is not to have a room full of weird silent ghosts or little robots, but to train ourselves and our children in how we approach a holy and mighty God in worship. It is hard work, no doubt. But training for worship is also training for all of life, and if you set the expectation that your children will learn how to be still and quiet, you’ll find out along the way that you’ve not only raised children who know how to worship, but children who also know how to behave in public around other people in all sorts of venues. That’s kind of a sweet two-for-one deal.